Anyway, it’s time to hit the trails again. Yesterday’s endeavor was originally going to be lakes Talapus and Ollalie, but driving out to i90 views were actually decent. 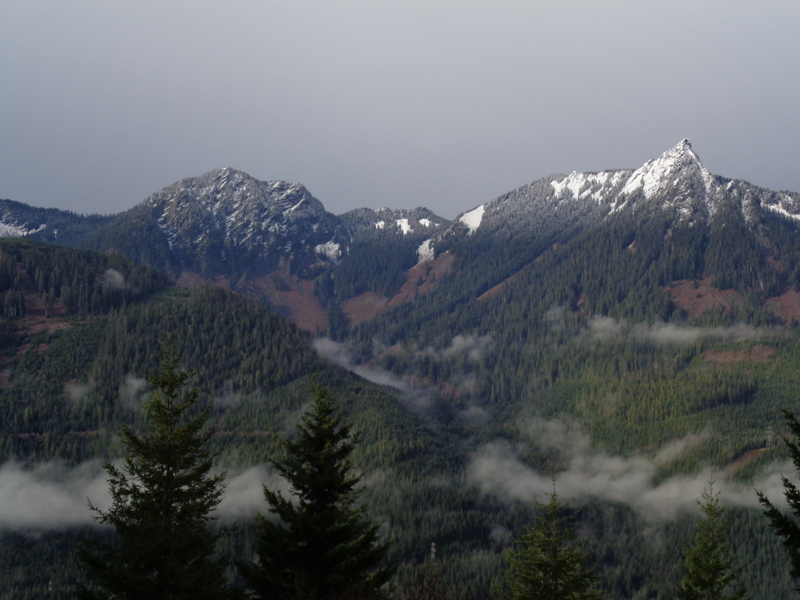 Overcast, but you could see much of the Cascade range, so we regrouped and decided to attempt Mt. Defiance. 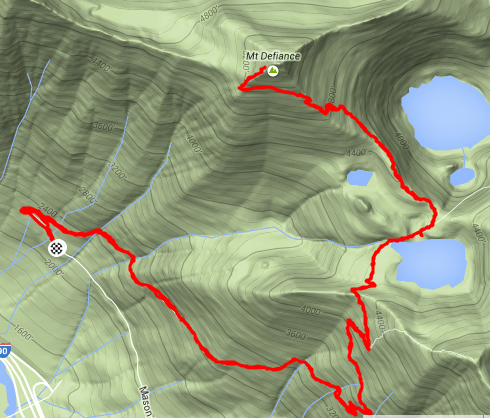 Being an ambitious idiot, I thought it was 10 miles, and figured it couldn’t be too steep since it was just past Mason Lake. This will be important later. Spoiler alert: it’s 11 miles, and I’m dumb. And this morning my legs were sore. That’s rare. Did I Trip: Yes. So did Lee. Turns out we’re kind of clumsy. 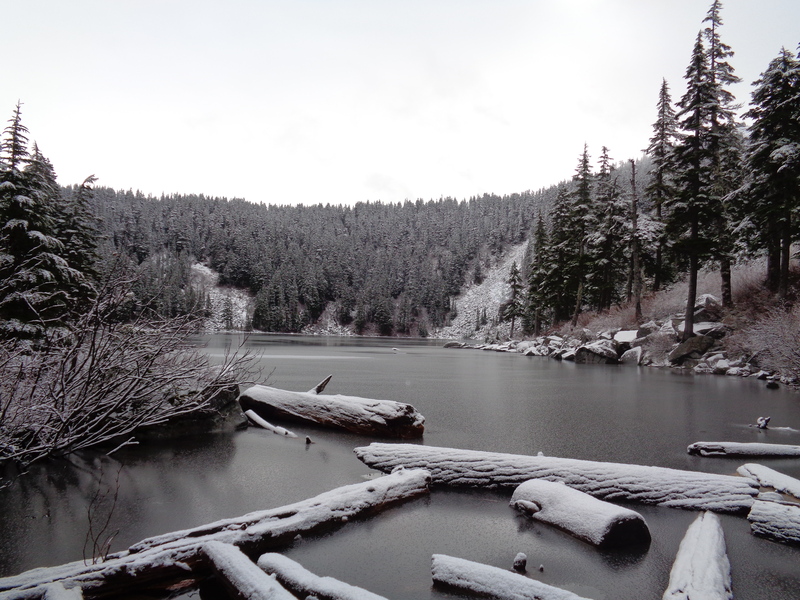 We pulled off the highway to drive down to the Mason Lake/Ira Spring trailhead. The road gets worse every time. Last month I had a Subaru struggle to clear the potholes going 5mph. This time… 10 inches of clearance. Four wheel drive. Mud tires. Great suspension. I had a blast. I can’t imagine Lee was very comfortable bouncing around in the passenger seat while I bombed through puddles. I didn’t make Lee get out to take a picture, but next time. There were a few other cars at the trailhead (curious, as we only ran into one other person – the rest must have been camping), and before we knew it, we were on the way. I figured we had about 4 hours tops, if I wanted time to get back and shower before I had to work at 3. Beginning of the trail is just as it was a few weeks ago when I hiked with Dave to Mason Lake. The creek that was tricky to cross in February was much lower now, and we could just rock hop across. 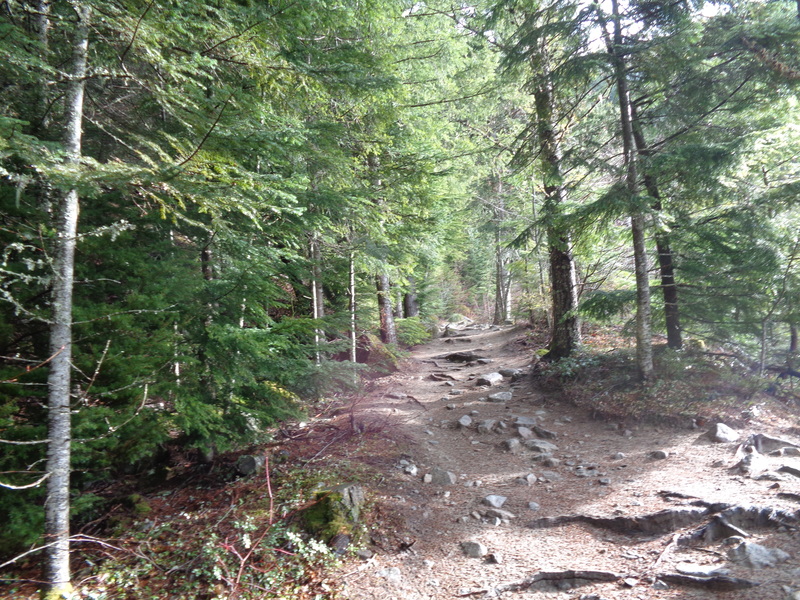 Trail isn’t too steep until the wide old logging road ends, and then it starts getting steeper. I passed those old steel cables again, and still have to wonder what the hell they were used for. I was told a few months back on McClellan that there used to be lights for airplanes on Catherine, McClellan, and Bandera peaks, so that’s my best guess. It’s just a few scrappy remnants at this point, so I might never find out. I’m a dork, guys, I like finding the history behind certain trails and areas. We were at Mason Lake within an hour and a half. I knew we had to push the pace if we wanted to make it to Defiance without making me be late to work. Remember when I’d wake up at 5 to go hike and be back for work at 2? And how I’d consistently underestimate the time it’d take me to complete a hike? Yeah, that’s happening again. I briefly considered heading to Bandera at the trail junction, but was feeling a little lazy and didn’t want to tackle that last mile. So we headed to the lake, with the hope of reaching Defiance. No views of Rainier at this point, but still clear so far! Mason Lake was actually spectacular. Half melted, but with a light dusting of snow all over the logs and surrounding rocks, the lake was a respectable destination in itself, and one that I would have been happy to repeat. We kept moving, and met up with the main trail, which was signed right at the lake. Following that for a few minutes, we came to a sign pointing to the Defiance trail (or Mason Lake, or Pratt Lake, or Thompson Lake) and took off towards the peak. 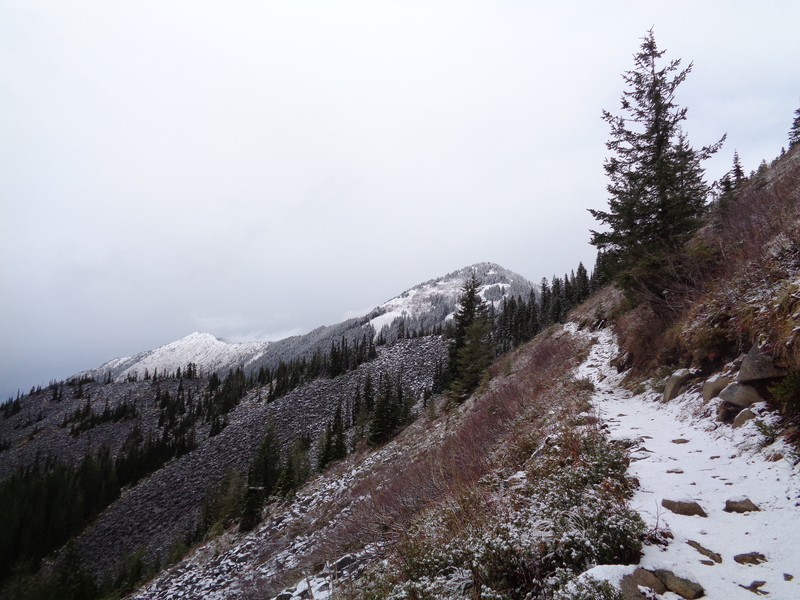 The trail had become covered in a light dusting of snow, and we plugged along. We had a few sneak peeks of views, but nothing too open. 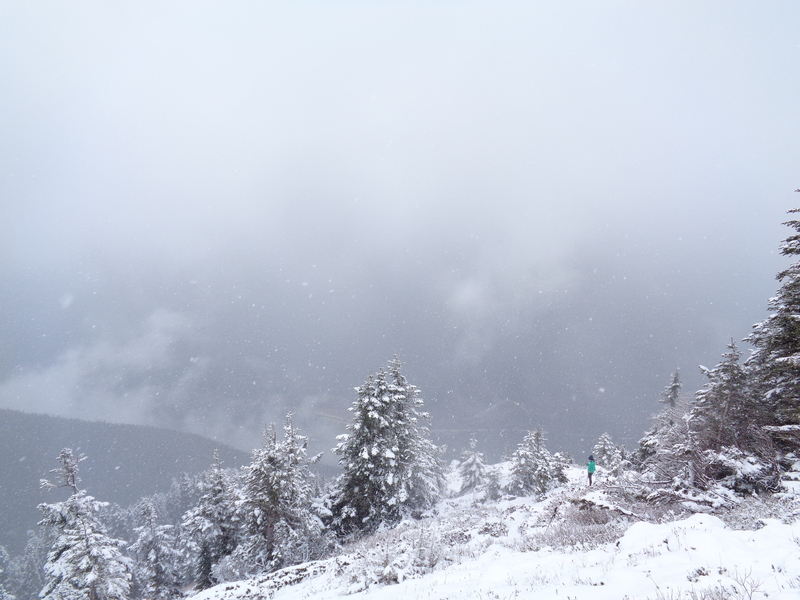 Soon it was actually snowing, and I started to wonder if we’d even have views by the time we got to the top. By the way, the last two miles to the peak are steep! I underestimated it, and it was a wake up call for my buns and thighs. I’ll trail run it someday (besides the steepest parts) because it’s close to Seattle and a good distance for a morning run. And it has long flat sections. Which, of course, mean short very steep sections. But you know what? We were in a winter freaking wonderland. I don’t think either of us had seen snow since December. It was amazing. There were just a few inches, not enough for spikes, but poles were nice. We broke out along the meadows about a half mile from the top of Defiance, and despite the clouds dropping lower and lower, were impressed by the scenery. We could just barely make out Mason Lake (and Little Mason Lake, I believe) in the background. 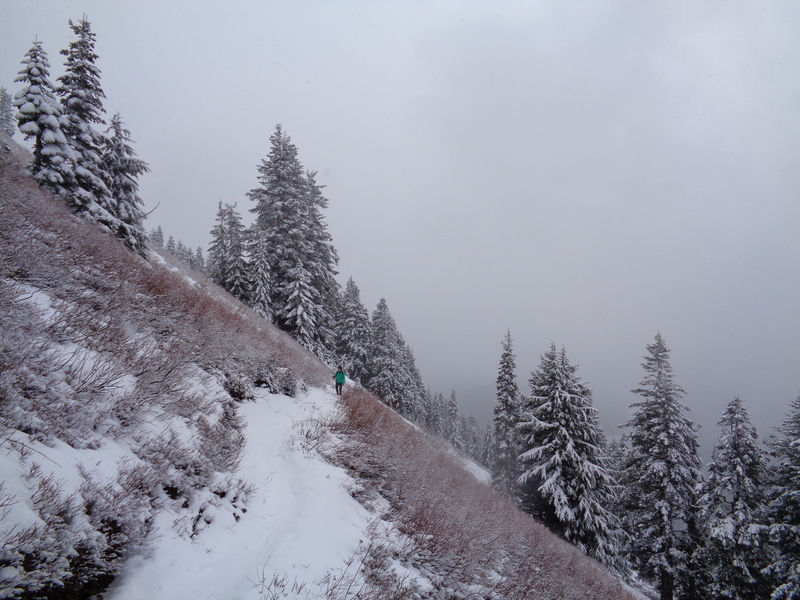 When the steep section of trail started, I left Lee behind for a few minutes to see how quickly I could get to the top. We figured it’d be socked in by clouds so it wouldn’t be worth bringing all our gear and trudging up there, especially since we were short on time. We were correct. Nothing but a wall of white, which was disappointing because I was hoping to see the topography and lakes Mason and Kulla Kulla laid out beneath me. But we’ll just have to go back another time. I ran back down the trail to meet Lee, and we headed back to Mason Lake. 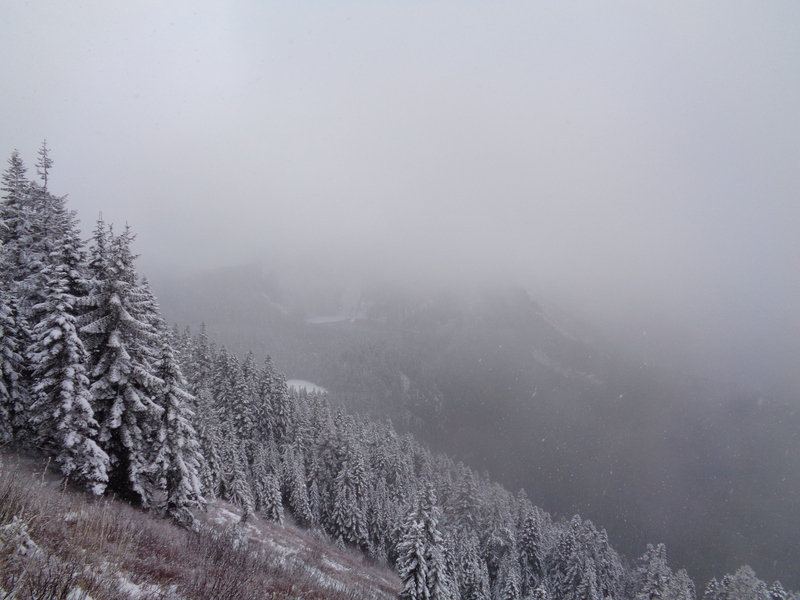 On the way down, it started snowing even harder, all the way down to 3500ft, maybe further. It brought out our inner Bostonian snow-loving joy (or maybe just hiker’s high? Like runner’s high? Damn endorphins) and we stopped in amazement for a bit to try and catch flakes. 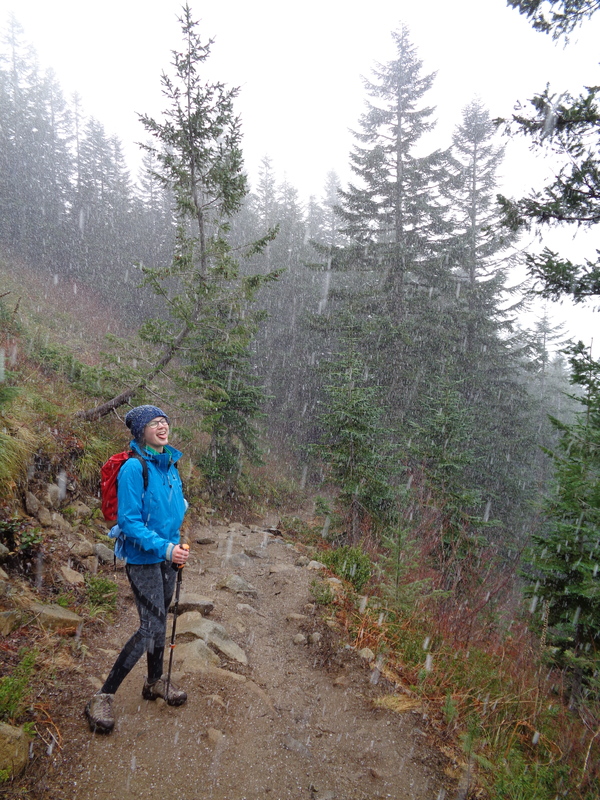 Soon afterwards, the snow turned to rain (of course) and we speed-hiked the rest of the way. Made it back to the car in just under 5 hours round trip, and just enough time for me to drop Lee off, grab a change of clothes, and go straight to work. Shh, don’t tell my coworkers. Strava map and link here. Turned around along the ridge before the true summit since Lee was waiting below and there weren’t going to be views at the top anyway. Next time! It’s great having the hiking freedom again. With spring coming up, there’s going to be so much to do, and this is why I moved out here. I packed up my bags and drove out here to be surrounded by mountains, not for a job, or for friends, or for the hipster flannel beanie coffee lover vibe. Mountains. Hiking, climbing, trail running. Let’s do it. EDIT: Just found out that they’re considering logging the bottom of this trailhead, as well as a few others in the area. The old logging road that this trail follows at first will be re-opened as just that. It will affect Talapus and Ollalie, Granite Mountain, Pratt Lake, McClellan Butte, and a few others. 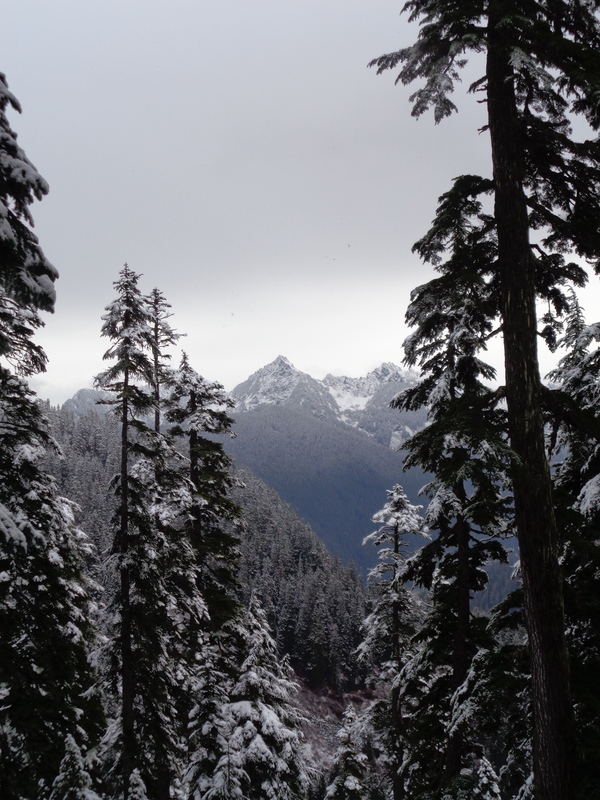 All close, popular, accessible hikes. Bummer. I was too late to give input, but hopefully they’ll decide to at least avoid the trail areas. I just moved out here, give me a few more seasons before moving in the loggers! This entry was posted in Cloudy Days, Snoqualmie Pass. Bookmark the permalink. Maybe those rails are left over from the last time they logged that placed.